Microsoft is currently running a special on the Lumia 550, and it’s focused on T-Mobile. Microsoft’s online store is offering the Lumia 550 for $99 unlocked, down from the $139 price tag that it originally launched with. 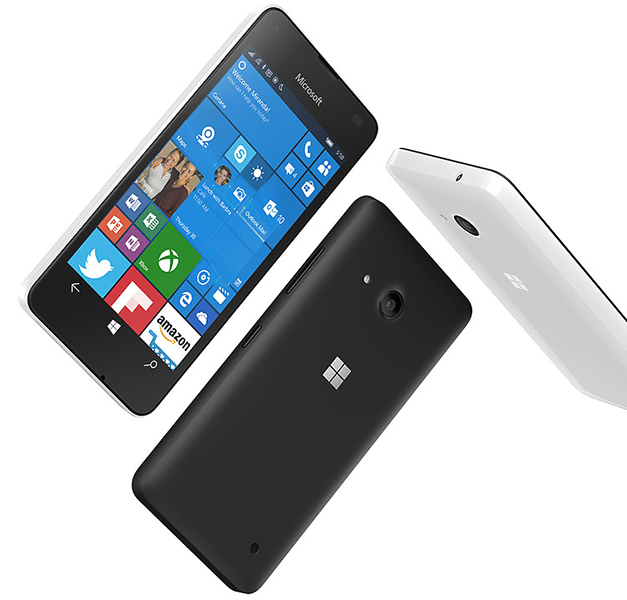 When you buy a Lumia 550, Microsoft will throw in a free T-Mobile SIM card. Specifically, you’ll be getting a prepaid 3-in-1 SIM kit with 40 minutes of airtime. The SIM kit will automatically be added to your cart when you add the Lumia 550. The Lumia 550 runs Windows 10 Mobile on a 4.7-inch 1280×720 display and features 5-megapixel rear and 2-megapixel front cameras. Also included is a quad-core Snapdragon 210 processor, 1GB of RAM, 8GB of storage, a microSD slot for adding more storage, and a 2100mAh battery. Microsoft says that the unlocked Lumia 550 includes support for LTE bands 2, 4, and 12 (as well as 5, 7, 17, and 28), but don’t expect T-Mo VoLTE or Wi-Fi Calling support. The only Windows 10 Mobile smartphone currently offered by T-Mobile is the Alcatel Fierce XL, which is priced at $0 down and $5.84 for 24 months or $139.99 full price. T-Mo’s Lumia 640 is expected to get an update to Windows 10 Mobile, but it’s unclear when that update might arrive. So if you’re in the market for an affordable new smartphone, or you want a cheap way to give Windows 10 Mobile a try, and you’re ok with not having VoLTE or Wi-Fi Calling support, this Lumia 550 deal could be worth a look. Microsoft says that this Lumia 550 deal will be goo through June 20. Thought about it…for one second. My Nokia’s still running fine; can’t say that about iPhones, even recents ones. I have the 950Xl and my daughter and her husband has the 6s+ and my 950XL windows phone smokes theirs for breakfast in quality build and specs . Removable battery , bigger and better screens specs , expandable memory and not to mention a better OS all around . When i get notifications on my clear tiles i can see what it is , not some stupid little red dot with numbers that you still have to open just to get the info . And yes i get updates all the time , no issues there either . It’s not a debate with me i could care less which phone other users want to use , i was responding to your misinformation about “no-longer-receiving-OS-updates” which is clearly BS . I just received two recently , and even though my phone is a 950XL , all windows 10 phones will get those same updates . As far as a “consumers have spoken” , just because IOS and Android has more apps does’nt mean anything else on the market is done . Some people don’t need unlimited fart and game apps 24/7 to get through life on a smartphone. There are many other reasons people choose windows phones over others . That would be like claiming “the market has spoken” and ending all debate about web browsers when Internet Explorer passed 90%. Things can change, but not in this case. Microsoft snoozed letting Windows Mobile… Windows Phone… PocketPC Phone (whatever they called it at the time) represent their best mobility effort while the market catapulted on by. When Windows Phone 7 finally rolled around, it was too late — now it’s just embarrassing for them. Windows 10 Mobile is a damned fine OS. It would be an embarrassment for humanity if they rejected competition in the mobile market. Why do we want to homogenize on Android, again? …or the Palm-Pilot PDA. Windows (10-Mobile, Mobile, Phone, PocketPC, PocketPC Phone, etc) can join them all as a historical Wikipedia article. Embarrassment to humanity is right on. It’s pathetic how the idiots of the race continue to fall victim to groupthink and constantly homogenize markets and remove viable competition to their own detriment. I rather save money every month than have free pizza. so you have no evidence to the contrary. Understood. Or name me a major consumer market that isn’t devolving into only a few large players with a lack of viable competition. My brother keeps wanting to buy me one. I respectfully declined, also because they aren’t waterproof/dustproof. So the SIM won’t work with post-paid plans, i.e., is it a pre-paid only SIM card? In my experiments, I’ve been able to reuse T-mobile SIM cards multiple times. But I haven’t actually tried bringing a prepaid sim to a store for a post paid plan. T-mobile treats all SIM cards the same. Except they wont let a phone sim be used in a tablet. I successfully got a prepaid line added to my postpaid account for my little brother. All it took was a call to CS. Absolutely painless. That I’ve done, but it isn’t necessary. They expire if you don’t renew/reuse it by a certain date. I assume that once you renew it and then cancel it, that clock restarts, after which the SIM wouldn’t be able to become activated as a prepaid card again. I don’t think a prepaid card can be used as a postpaid card, but I could be wrong. About a year ago I bought a new unlocked phone that needed a new nano sim. Instead of paying the full price, T-mobile was running a promo for $1 for a pre-paid sim kit. When it arrived, I inspected it and it had no labeling about being prepaid and I was able to convert my line over to the new sim on T-Mobile’s website. I had to reread it. I thought it was the 950 and got excited.definitely pass on this deal. Used one for a short time. Phone runs smoothly, slight learning curve or should say slight learning curve to forget Apple or android moves. Apps are limited. If you want an inexpensive smart phone this is the one. New class of burner phone. If it’s new sim always comes with new phone. I kind of want a windows phone just to say I used one 50 years from now. It is sad. My first few phones are Windows Mobile of many years ago. I remember doing ActiveSync so I can sync my desktop and the phone. That was stupid. One day I install Office 64 bit and the ActiveSync doesnt work because its still in 32 bit. I am using Android phone now and never look back since. That is sad, because comparatively Android can be a much more problematic OS than modern Windows 10 Mobile. If too many people myopically stick with Android it may end up being the crap we are all stuck with forever. That is the problem, unfortunately Windows is not the solution because of Microsoft and its 1GB/8GB phone for $99.